Just briefly what it does. PIC's code FLASH memory is organizationally splitted into 2 areas. First one is permanently used by bootloader itself - it is code which cooperates with programming software to get your user code into PIC. Second part (rest of code FLASH memory) is available for your code. That means, smaller the bootloader is, bigger your code might be. And that is the reason, why you could not use any HEX code available on internet with bootloader - because it will not work. What is a boot loader, and how would I develop one? It is really brief and exhausting forum reply you have to see. 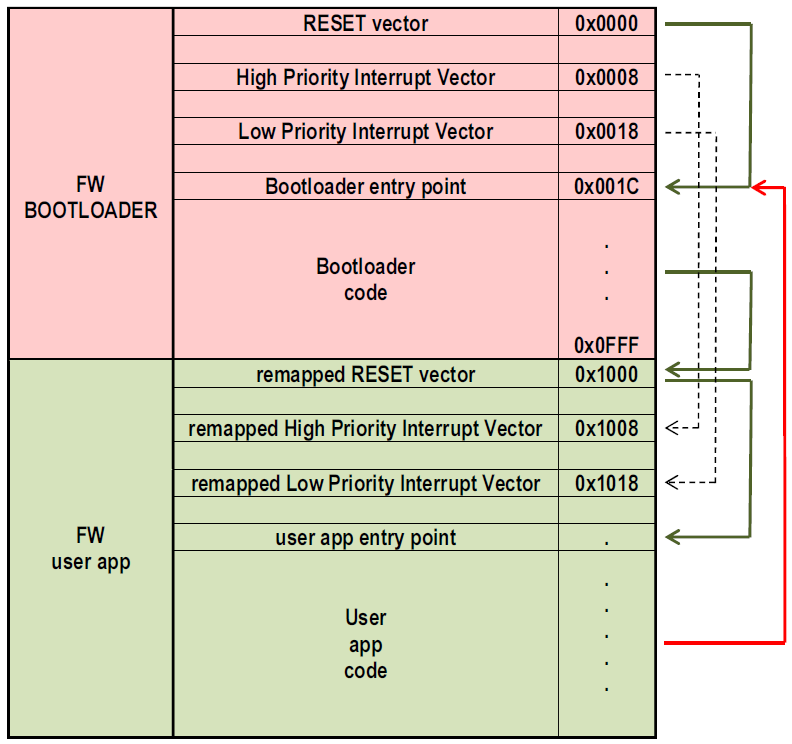 how such a bootloader works in principle detaily described in Microchip's article AN851 AppNote for a FLASH Bootloader for PIC16 and PIC18 Devices and AN1388 AppNote for PIC32 Bootloader. If you are interested more on these ones, you can continue reading on Microchip's forum topic Free Bootloader for PIC. From my point of view it is good for first experiments to start with something already tested, proven that works, and ideally available from manufacturer. All criterias mentioned in sentence above are met by USB bootloader from Microchip available at Microchip Libraries for Applications. I have used version 2013-06-15 Windows. All source code references in this section are to sources located in \microchip_solutions_v2013-06-15\USB\Device - Bootloaders\HID\Firmware - PIC18 Non-J\ of these libraries. All necesarry you will find summarized in one archive at the bottom of page in Downloads section. 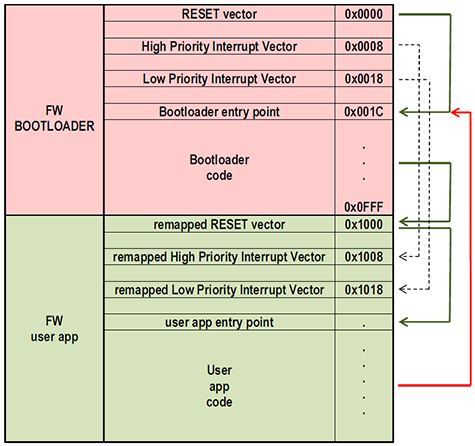 Red wire shows how your user program can hand control over bootloader. Green wire shows how your user program gets control since PIC is powered on (when RB4 is connected to VCC/+5V). But nothing happens on PIC18F2550 or PIC18F2455, because these do not have gate D.
not use D0 pin on PIC18F4550 or PIC18F4455 (LED signalizing USB HID bootloader activity). I have tried several available compilers available for PIC but only one created working binary compatible with bootloader. Seems compilers (like HI-TECH C for PIC18, MPLAB XC8) do have problem with entry points rellocation except MPLAB C Compiler for PIC18 MCUs. With MPLAB® X Integrated Development Environment (IDE) it is very easy to use. There is very useful article with detailed decripton what and how has to be modified to get application working with USB Bootloader for PIC18F2550. There is complete application template attached, too, which I have used to get my first working application uploadable by USB HID bootloader. There has to be only changed parts that are relevat to Microchip's USB HID bootloader relocation addresses. This tempate uses 0x1100 base address, we need 0x1000 base address. Modified template with 0x1000 base address you can find for download below. You have just to import it to your MPLAB IDE and modify code as you need. This template just blinks LED on port RB6 and RB7, for details see my LED blinker article. This will allow me to bring more information and projects for you.